She is definitely dated but I love the details of the wood, the wire meshing and her overall look. Plus her size was just perfect for breaking up our rather long kitchen wall. So after painting the kitchen I finally made the decision on what color to paint my ReStore beauty! Then I went ahead and dolled her all up for Christmas! I filled her shelves up using pretty white Ironstone and loads of green and red accents. 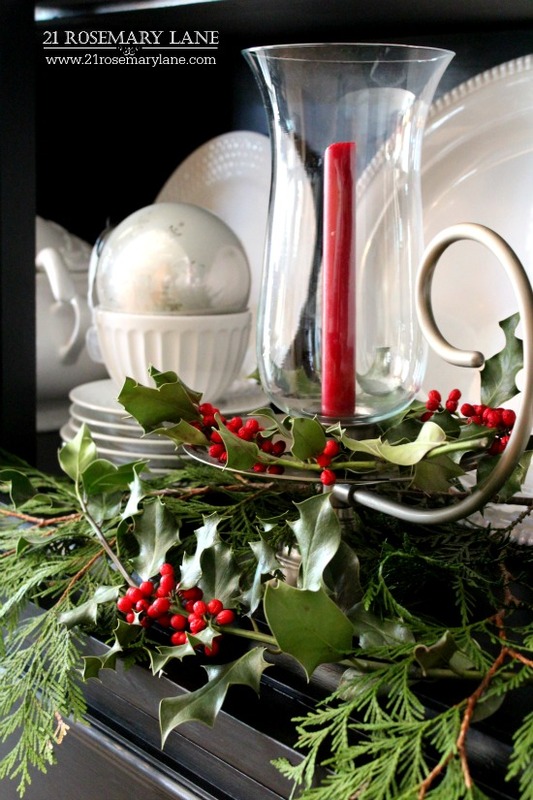 To add some beautiful and natural holiday touches I cut sprigs of arbor vitae from my next door neighbor's ginormous trees (she did give me permission), and paired it with the gorgeous holly sent from my dear friend Judy over at Gold Country Cottage. This little guy was in my home when I was a little girl. He must be about 40 years old! 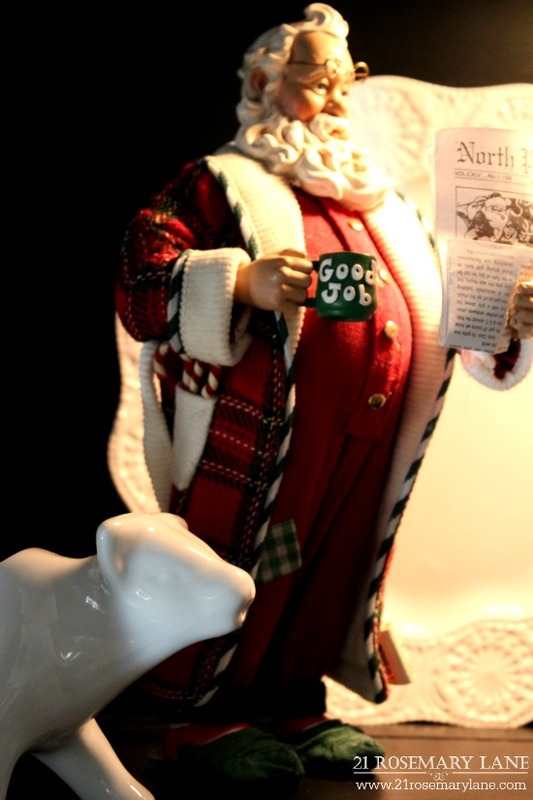 And this is my favorite Clothtique Santa! perfect for the kitchen right??? 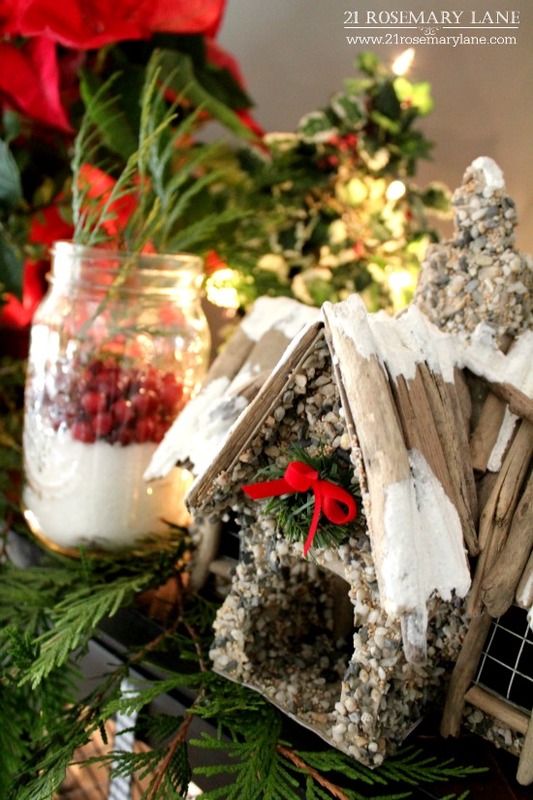 More sprigs and other natural elements were placed on her top along with a few twinkle lights, holly trees, pretty red poinsettias and a little stone house I picked up at TJMaxx a couple years ago. I think she looks incredibly sophisticated in her new sleek black finish. And she is soooo pretty standing very regal in our kitchen all decked out for Christmas. I am almost ready to reveal the finished kitchen. Unfortunately while shooting my pics today I managed to have a little accident with my Cannon Rebel and now she is not working. Praying for a Christmas miracle and that I don't have to send it out in to be repaired. I'd hate to not have my camera for the holidays. Keeping my fingers crossed Mr. RL can work a little magic and fix her for me. In the meantime enjoy the beauty of this special time of year as you prepare for the blessed celebration of Jesus's birth. Wishing you all Peace Comfort and Joy! Oh my word, the hutch turned out so beautifully. I love it in black and your displays are stunning. What a fabulous piece. OMGoodness this is stunning! 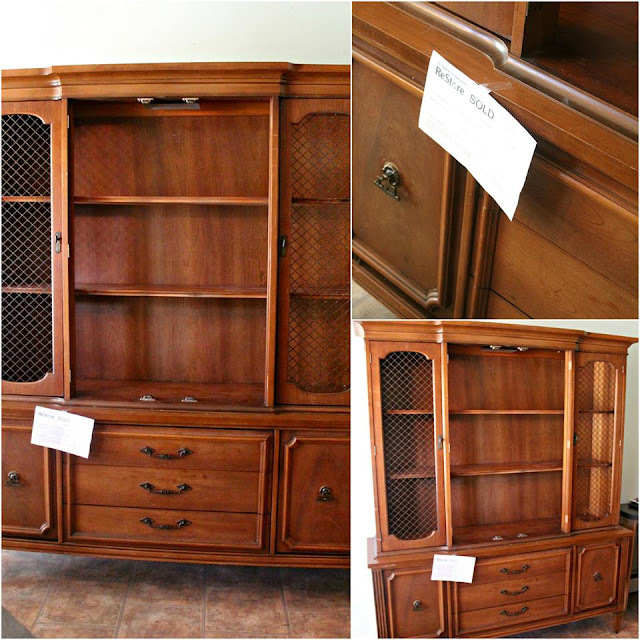 Forty dollars, you stole this:):) Merry Christmas and thanks for sharing the "new" hutch all dolled up!! WOW!!! Job well done, indeed! She looks perfect! Absolutely positively gorgeous! Great job! Hope you're camera is okay. Barbara I was laughing while I read your post. I went to Habitat a few years ago and bought a beautiful hutch that is in my kitchen. I laughed because I went again last week and found upper and lower cabinets. My hubby and I moved the other cabinet up to my craft room and our contractor will be here Monday or Tuesday to hang the upper cabinet for us and then I can load it and decorate too. We cut it close didn't we. 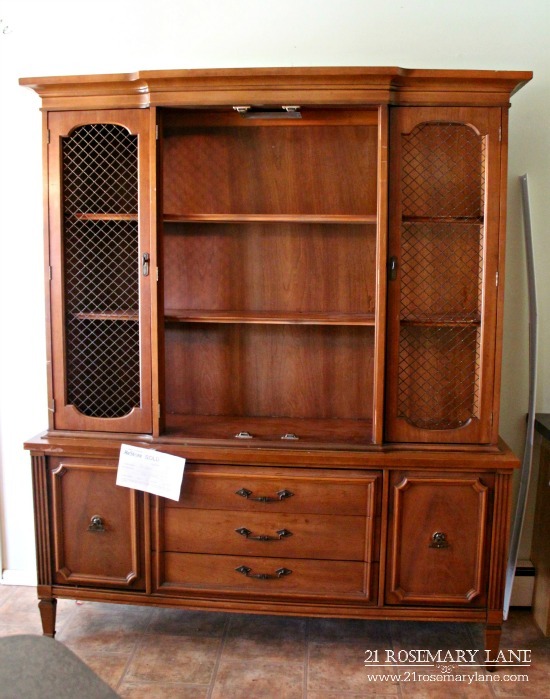 Your hutch looks beautiful! What a transformation! 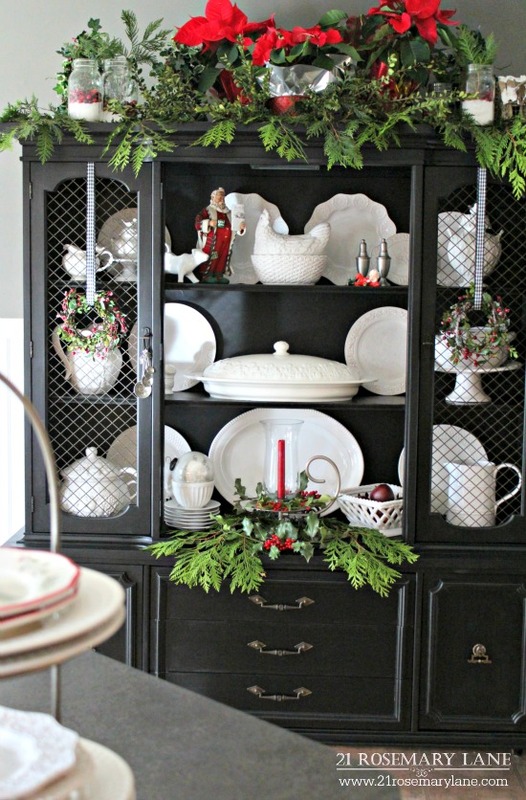 Your painted hutch is gorgeous! 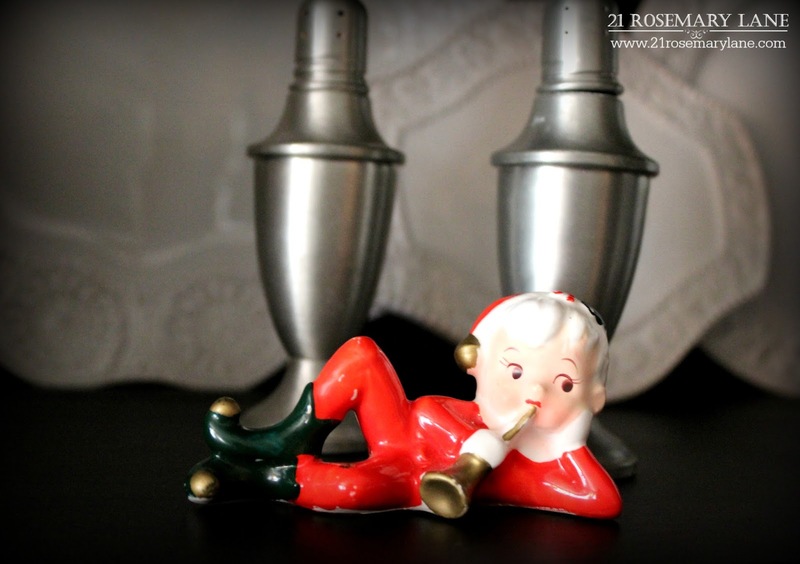 And the Christmas decorations along with your pretty white ironstone makes such a beautiful picture. Love it! Wow it looks gorgeous painted black! I love the way you styled it too! Wow what a transformation! So elegant in black! It really makes a lovely statement. 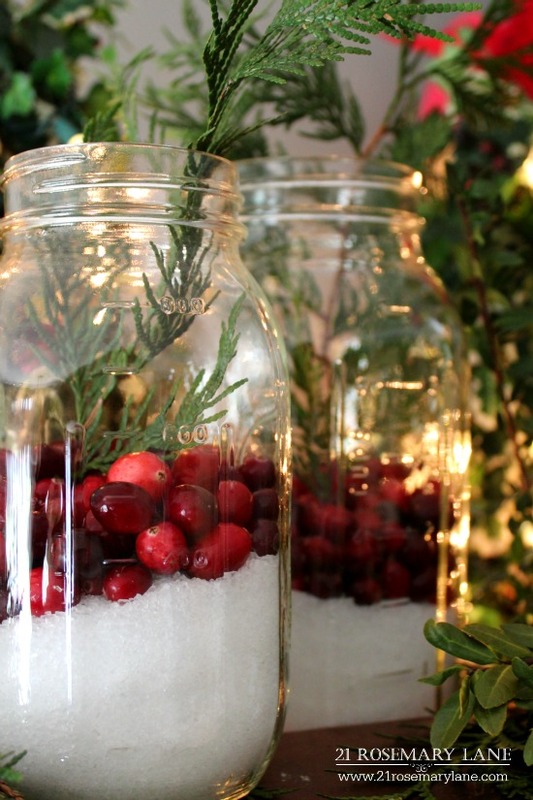 Such a nice choice especially when using to display all white dishes. And with the holiday decorations and greenery, it is exquisite! this is gorgeous, Barb! love the black, it's so dramatic! So beautiful! I love the black. Completely transformed from dowdy to eye-popping beautiful! 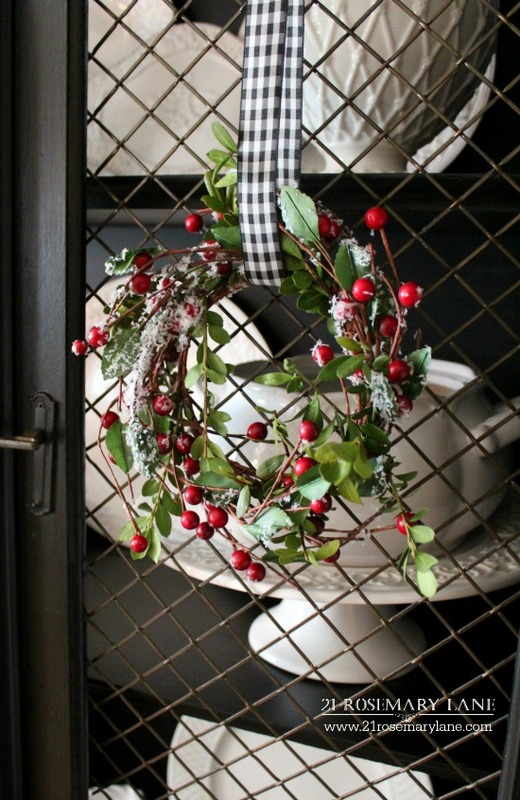 The contrast of the white ironstone and pops of red and green are stunning! Great job! How gorgeous it looks! 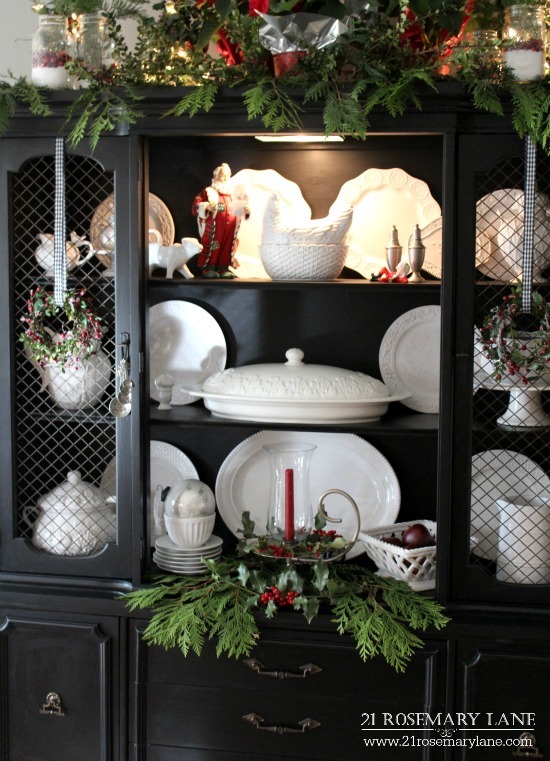 The black is such a striking background to your beautiful ironstone pieces, love it! Love your new restored piece. Your Christmas accents are so peaceful. Looks great. I would have never thought to use black, but it turned out really nice. 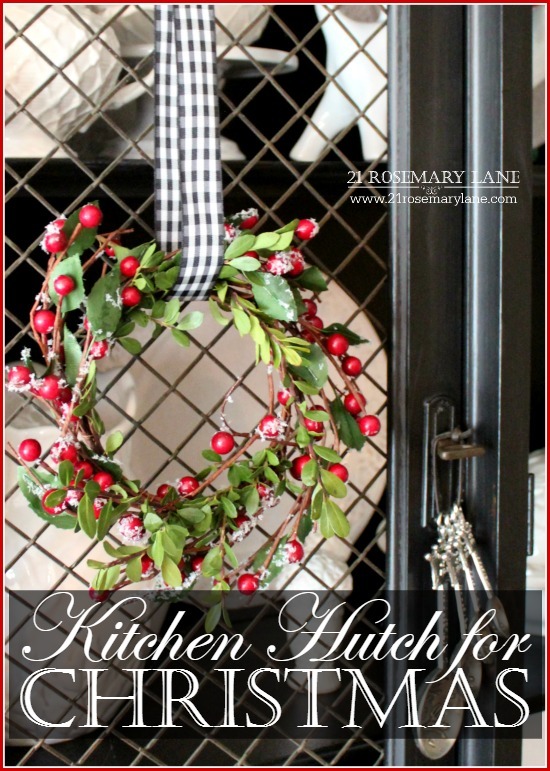 Your Kitchen hutch painted black is stunning, dear friend!!! I adore the white ironstone within!!! truly accentuate your choice of hue!!! I'm just crazy about your hutch, Barbara! Your styling and white dishes are stunning! Love your Blog. Thanks so much for sharing. Your painted furniture projects are gorgeous. You make it look so easy. 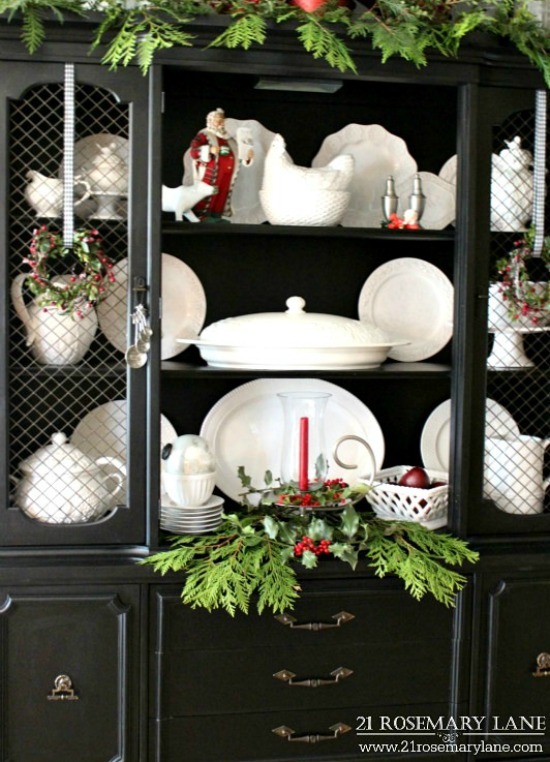 What type of paint did you use on this black hutch?? And do you seal your painted pieces?? I typically do some sanding before painting just to give the paint something to hold on to. The only paint projects I seal are the ones I where I use chalk paint. Those projects are typically sealed with some type of wax product like a Minwax. The hutch paint is a black satin from Rustoleum...not the spray but a regular roll on paint. Hope this helps.